In a landslide that rivaled their NL East-title ambush this season, the Mets completed a dissection of the Cubs on Wednesday that left them within four victories of baseball’s coveted crown. The Mets are headed to the World Series, following a four-game sweep of the Cubs punctuated by a 8-3 victory in Game 4 of the NLCS at Wrigley Field. Lucas Duda, who had been almost nonexistent for the Mets in their previous eight postseason games, was the hero with a five-RBI performance that allowed rookie Steven Matz and the bullpen to coast in the most lopsided game of the series. “I’m standing there in the dugout in the ninth inning and I’m just looking at all the guys and thinking, ‘How did they do it?’ ” manager Terry Collins said. “How did they keep it together? How did they stay focused? Daniel Murphy established an all-time postseason record by hitting a home run in a sixth consecutive game. He finished with four in the NLCS and was named series MVP after batting .529. In nine games this postseason, Murphy has seven homers and 11 RBIs. Curtis Granderson might have better summed it up. “I’ll get a chance to tell people I played with Babe Ruth,” Granderson said. The Mets will play Game 1 of the World Series on Tuesday in Kansas City or Toronto, pending the outcome of the ALCS. It will be the Mets’ first World Series appearance since 2000, when they lost to the Yankees in five games. 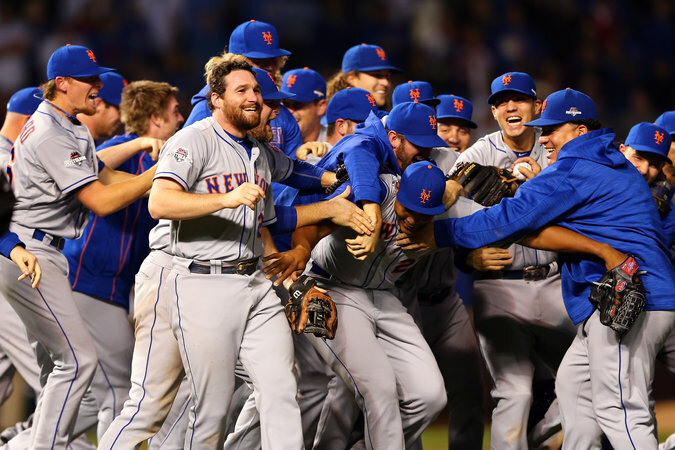 The Mets will be seeking their first World Series championship since 1986, when they beat the Red Sox in seven games. If there is a concern for the Mets, it’s that Yoenis Cespedes departed in the second inning with what the team called left shoulder “soreness.” Cespedes, who is expected to receive a cortisone shot, called it a sore joint and vowed to be ready for the World Series. “If not, I will chop if off and put a new one on,” Cespedes said. It was young, talented starting pitching that got the Mets their first division title in nine years, and that crew was largely responsible for sweeping the Cubs. Matz lasted just 4 ²/₃ innings on Wednesday in which he allowed a run, following dominant starts by Matt Harvey, Noah Syndergaard and Jacob deGrom. The sweep allows Collins to align his rotation as he pleases heading into the World Series. The Mets did not face the Royals during the regular season, but split four games with the Blue Jays. Even so, the Mets showed in this series that regular-season results carry no weight in the playoffs: The Cubs were 7-0 against the Mets in the regular season. Wednesday’s game was essentially over before the Cubs took their first at-bat of the night. Duda smashed a three-run homer off Jason Hammel and Travis d’Arnaud followed with a blast. Matz took the mound with a 4-0 lead and wouldn’t throw a high-pressure pitch all night. Bartolo Colon replaced Matz in the fifth and worked 1 ¹/₃ scoreless innings before Addison Reed, Tyler Clippard and Jeurys Familia finished it. Granderson singled leading off the game and stole second, before Cespedes walked with two outs. Duda, who entered batting only .125 this postseason with one RBI, followed with a no-doubter that cleared the wall in left-center and d’Arnaud reached the right-field seats for his third playoff homer. For the Cubs, it’s wait until next year after going a 70th straight season without a pennant. The franchise has not won a World Series since 1908.